Whether your child is 4 years old or 14, chances are you’ve had more than a few school clothing arguments. Maybe your son wants to wear his Superman cape to kindergarten. Maybe your daughter insists on buying tops in garish colors. Whatever the cause, it can be draining if you and your child are clashing frequently—especially if it’s happening first thing in the morning or delaying the bedtime routine. Carleton Kendrick, a social worker and family therapist, has another perspective for parents: Think critically and carefully about what’s behind the school clothing arguments. 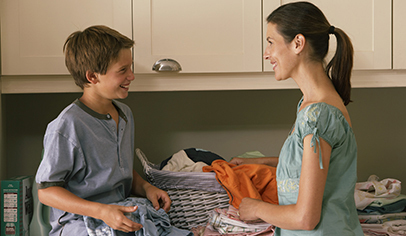 Does the wardrobe choice create a health issue or conflict with your family’s core values? If not, you might just let it go. In other words: Pick your battles. You and your child will probably disagree over school clothing plenty of times, so save the fight for when it really matters. As the parent, you have a lot of say about how your child presents himself. To help decide whether a fashion disagreement should be treated as a more important conflict, think about these key questions. School Clothing Arguments: Are They Worth It? Is my child’s safety or health at risk? It makes sense to keep kids from wearing baggy jeans that might get snagged in a bicycle chain. Is the clothing itself really the problem, or is it a symptom of something else? Maybe it’s difficult to see your kids growing up so fast, Kendrick says. Or maybe their school clothing choices are a kind of rebellion. Some parents might also find it difficult to handle “pushback” from their children over questions of control. Are my objections really just a style preference? You can’t stand stirrup pants, but your daughter loves them because they stay tucked into her socks. Fluorescent green—your son’s favorite color—makes your eyes hurt. Or, really, a mullet hairdo? Is my main concern what other people think? This hits a visceral spot for moms and dads, who might worry that others will view them as bad parents based on how their child looks. Instead, remind yourself that it’s important to your child: “Obviously my child cares about this. He or she put on the clothes,” Kendrick says. Is the clothing inappropriate for the setting or activity? There might be nothing inherently wrong with your child’s favorite pair of sweatpants; on the other hand, if they violate the dress code, then wearing them to school might be a concern. Similarly, if today is arts and crafts day, then the frilly princess dress isn’t the best option. Are my child’s clothes in violation of our family’s “rules”? “It comes under ‘What does our family stand for?’” Kendrick says. “‘Am I [the parent] being asked to compromise and/or ignore my own beliefs?’” That might mean inappropriate language printed on a T-shirt is unacceptable, for instance, but it should be separated out from the larger issue of style. The most important part of any parent-child conversation (about fashion, music, or anything else) is to ask open-ended, nonjudgmental questions. Keep the focus on the style and its appeal rather than on your child. And above all, don’t forget those times your own parents thought your style choices looked silly—they might even have a few pictures to prove it. “If any words or graphics represented do not represent the values that your family holds, then you have every right as a parent not to allow your child to wear that,” Kendrick says. But, he adds, “I always think it’s nice to offer a plan B. ‘It can’t be this, but let’s see what it can be.’” For example, look for tops similar in overall style—rhinestones, rock band, etc.—without the offensive images or language. If jeans with frayed edges and torn sections just aren’t your thing, consider asking your child to save up to purchase them on her own. To address modesty concerns look for a pair with its tears and rips in less provocative spots, such as right above or below the knee. For issues about the jeans being appropriate for the setting or activity, suggest that your child bring the pants along and change into them afterward. But, it might also be a matter of your child accepting that it’s the wrong time, wrong place to wear them—for example, if it violates a family rule to “show the appropriate respect for who you’re with and who you’re visiting,” Kendrick says. Because experimenting with haircuts and hairstyles has minimal health risks, Kendrick thinks it’s OK to give kids relatively free reign. “But that does not mean parents are prohibited from expressing their lack of support,” he says. “It is not unkind to say what your opinion is about the response they’ll get…or, ‘I think there are different ways to wear your hair or to color your hair that would be more appealing for you.’” The key to making this stance work, however, is to share your opinion once, then let it go unless your child brings it up again. For garments that are too revealing, one popular compromise is layering. For instance, a short skirt or dress can go over leggings, and a low-cut or strappy tank can combine with another tank or top underneath. School clothing arguments can be taxing on everyone involved. Understanding the balance between what school clothing choices might truly be inappropriate and what’s simply irritating to the parent can help both parents and children determine the right boundaries and decrease how often school clothing arguments occur. Originally posted in 2010 and updated regularly.